Anne Mateer joins us today. Her debut novel has just released, set during World War I and the flu pandemic. She's got a great style of writing and I'm giving away a copy. Just leave a comment below with a book you've read that had research that pulled you deeper into the story. I love research. As a history major (way back in the dark ages when libraries weren’t automated and we still had to use the card catalog), I loved digging through dusty stacks in back corners, finding obscure texts that no one had opened in decades. Especially if those texts were transcriptions of letters or diaries from ages past. I loved discovering what people thought and talked about, what they did in their day-to-day lives. All of this fueled my desire to write historical fiction. But guess what? Of all the cool things authors learn as we research, only a fraction make it into the final product. That was certainly true for me when I wrote Wings of a Dream. I was able to incorporate some very specific events into the text, some from general research, some from family history, but many others got cut and pasted into the “scraps” file on my computer. Like the staggering fact that 25,000 pilots received their “wings” at Love Field in Dallas during the year of 1918. Or the horrific week in October of 1918 when almost 4600 people died of Spanish flu in Philadelphia. Yes, in one week, in one city. They ran out of coffins. I’ve related but a few of the interesting bits of a research that didn’t find a home in Wings of a Dream. But who knows? There are many, many more stories to tell. Perhaps one day these pieces of information will find a permanent place. Learn more about Anne Mateer and her books at her website. All good historical have to be backed with good research or the reader can't get swept away by the story. I love history so I have a fair base of knowledge... when I read a book that doesn't line up I put it down. Loraine Snelling is my all time favorite author... she has a true understanding of life in the late 1880's that gets me sucked into every one of her books! What a great story about your great-grandfather. Having just finished my first historical, I find research fascinating. So much so that I have to remind myself that I'm supposed to be writing a book, not just reading one! I'm looking forward to Wings of a Dream. Congrats on your dream becoming a reality. I agree, the research needs to be right--both for the reader that knows the facts and for the reader that doesn't, so that they don't get wrong information! But it is always good to remember that some things that might not "seem" right can also be verified by primary sources that relate to a specific area of the country or the world in that time period that might not be true elsewhere. The Poisonwood Bible by Barbara Kingsolver is one of my all-time favorite books! Kingsolver's research into the political and social climate of the Congo during the 1960s opened my eyes to a completely foreign world. I love when a work of historical fiction points out aspects of an event I hadn't considered before. It's one thing to hear that "X number of people" died of the Spanish flu, but quite another to give flesh, a name or a family to those statistics. I am learning so much from Wings of a Dream! A favorite historical novel of mine? "These is My Words" by Nancy Turner, based on her great-grandmother's journals. 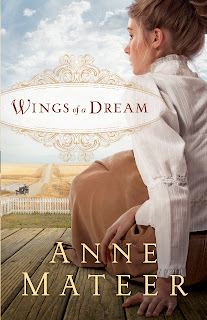 I recently read The Brides Of Gallatin Crossing-- An awesome Historical Romance and mystery combined......Would love to read "Wings of a dream". Wow! That's an amazing story about your great-grandfather. I recently read Jane Austen Ruined My Life, and it was like walking through Jane Austen's England. I've never been, but it was a filled with all these little snippets that made me head wish I was there. I'd love a chance to win this book. It sounds so fun! This summer I read Nancy Moser's book "Masquerade" and the details of the time period really drew me in to the story. I especially appreciated all the details she gave the clothing...I could really pictures the outfits. I love reading stories that took place in the 1800's or early 1900's in this country. I am currently reading Spring for Susannah by Catherine Richmond. It has me fully gripped with life in the Dakota Territory in the 1800's after the War Between the States. Please enter me in the drawing and thanks for the chance to win. This sounds like such a great story. I love reading books that take place during this era. I love historical books. As a reader, I so appreciate all the work that goes into researching a book. Can't thank you enough. Brings history to life for me. Hi Anne, I think the events you had to scrap are awesome. Maybe you can use some of them in another book. I love your story line for Wings of a Dream and can't wait to read. Thanks for stopping to chat and share with us. Congratulations to Grace for our mess. You are the winner! Hooray! Thank you so much, Cara and Anne ~ I'm so excited to read Wings of a Dream!